On July 5, 2017, I had previously written about my thoughts on bond refinancings. There is currently a tax bill moving through the branches of the Federal government, the Tax Cuts and Jobs Act, which may change the individual tax brackets, tax credits, corporate tax rates, and the estate tax, among many other things. These particular items have been the focus of discussion by politicians and the press. What is less discussed is a provision of the tax bill which may have significant reverberations in the municipal bond community: the removal of tax-exempt advanced refundings. First, let’s define some of the jargon. A “refunding” is a refinancing in which old debt is replaced with new debt (typically with lower interest rates). So a bond refunding is very similar in concept to a home mortgage refinancing. Municipal bonds typically carry an optional redemption date which is some date in the future that the bonds can be prepaid (or called) prior to maturity. Investors of municipal bonds typically prefer some level of call protection as it ensures they’ll receive a predictable level of interest payments for a certain period. California education bonds are commonly issued with a 10-year optional redemption provision. For example, a bond issued in August 2018 can have an optional redemption date of August 2028. An advanced refunding is defined by the Internal Revenue Service as a refinancing issued more than 90 days prior to the redemption date. In the prior example, refunding bonds issued prior to May 2028 would be considered an advanced refunding. 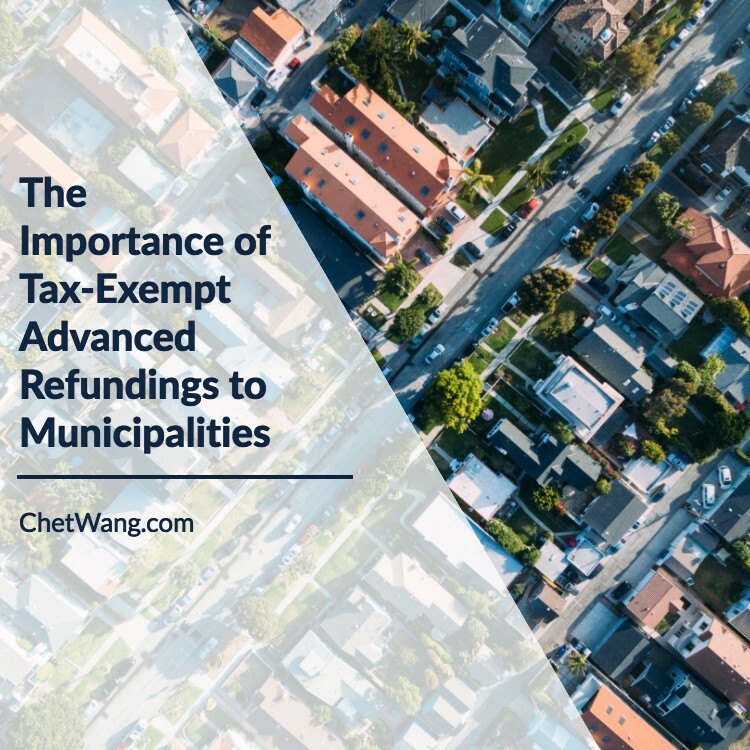 Notwithstanding the optional redemption date, municipalities are able to advance refund old bonds by issuing new bonds which generate proceeds for the future payoff. These proceeds are placed in an escrow account and invested in U.S. Treasury securities until the redemption date. Municipalities frequently monitor their outstanding debt for refinancing opportunities. Refinancing decisions are made on a case-by- case basis, and can be informed by potential interest cost reductions, public relations, or debt restructuring considerations. Removing the option for issuers to advance refund their debt potentially means that higher interest rate bonds remain outstanding longer. What Is a Current Interest Bond? Chet Wang is a registered municipal advisor with an exclusive focus on California education municipal bonds.